Will China’s Aircraft Carrier Cross Paths With New US Carrier Strike Group in Western Pacific? The U.S. Navy is set to deploy a new aircraft carrier to the Western Pacific. Will it cross path with China’s carrier? 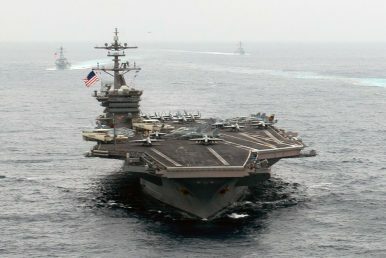 A new U.S. Navy carrier strike group, consisting of the nuclear-powered Nimitz-class aircraft carrier USS Carl Vinson and support ships, will depart for the Western Pacific this week to replace the Nimitz-class carrier USS Ronald Reagan as the U.S. Navy’s only forward-deployed carrier in the Asia-Pacific region. According to a U.S. Navy press release, the Carl Vinson Strike Group, consisting of two Ticonderoga-class guided-missile cruisers and one Arleigh Burke-class guided-missile destroyer, will depart San Diego on January 5 and 6. An additional destroyer will join the group later in the month. The carrier strike group will be based out of Yokosuka Naval Base in Japan’s Kanagawa Prefecture. “The strike group assets will conduct bilateral exercises in the Indo-Asia-Pacific region to include anti-submarine warfare, maneuvering drills, gunnery exercises and visit, board, search and seizure subject matter expert exchanges,” the U.S. Navy notes. The exact deployment schedule of the USS Carl Vinson has not been made public. According to The China Post, Chinese media is speculating that the carrier strike group will arrive in the Western Pacific in late January. “The Global Times newspaper cited a military expert as estimating that the U.S. aircraft carrier Carl Vinson would arrive in the West Pacific around Jan. 20, with the possibility of meeting Beijing’s Liaoning carrier, according to Taiwan’s Central News Agency,” the article notes. However, it is highly unlikely that the USS Carl Vinson will immediately deploy to the South China Sea following its transit from San Diego to the Western Pacific. “The expert told the Global Times — a Chinese government organ — that it remains to be seen whether the Pentagon will pick this sensitive time to escalate military tensions in the area. U.S. President-elect Donald Trump is due to be sworn in on Jan. 20,” the article adds. The People’s Liberation Army Navy’s (PLAN) sole operational aircraft carrier, the 60,000-ton Liaoning, has been conducting military drills in the South China Sea this week and it is unclear how long the carrier and its support ships will be cruising in the disputed waters. While it is pure speculation by an unnamed Chinese military expert, the mentioning of China’s largest warship in the context of the inauguration of a new American president nevertheless illustrates China’s willingness to use the carrier as a big stick to signal resolve to the incoming new Trump administration — particularly when it comes to the territorial disputes in the South China Sea. “Brinksmanship, if handled without caution, is very likely to lead to combat. In that scenario, Trump will have to decide if he wants to escalate tensions and destroy Chinese vessels, warplanes or island facilities. Without any doubt, that will result in a destructive war between the two major powers, in which there will not be a winner,” the op-ed cautions. Admirals discuss reducing risk in interactions between two navies at-sea.